Listhya Jan 15 2019 9:52 pm Ryosuke, I love you so much:) I atteded your concerts twice on Dec 28th and Jan 1st. It was really amazing. Thankyou for everything, I hope i could meet you again someday! etsu Sep 02 2018 11:13 am I love you,my boy.I will love you forever! shiharu Aug 05 2018 6:54 am hey boy, here i am again. dropping my yearly comment. it's been 8 years now. but you're always been that boy who wrecked my bias. seriously though, i am proud of what you have become. you deserve every good things in this world. i hope you get to showcase more of your acting talent. you are very hardworking idol and actor. Ｅｉｅｎ May 09 2018 9:52 am It was just an expected scrolling on youtube and something captured my attention ... the video was entitled *dont underestimate the jpop visuals* if not mistaken. Ive watched it and thats how i discover him. Then ive started searching about him and leads me to watch his movies and series. Well i can really say that this boy hooked my heart ? i though ''what a talented boy'' through people's messages i discovered a lot of things that makes him unique and make me love him more ❤ i pray that he will have a prosperous life throughout the years and a lot of projects to come. Sincerely waiting for his projects in the future, and also to the continuously arise of their group. Barbara Mar 27 2018 4:02 am I saw for the first time Fullmetal Alchemist, beautiful. You too are a beautiful boy, very good actor and singer. I had the opportunity to listen to your song and I liked it a lot. I congratulate you. Barbara, Italy. Gloria Dec 11 2017 10:38 pm I read many ppl here have a feeling same as me about you.. i feel a bit jealous but also im a little bit happy coz thag mean your hard work and your talent is " real " not just in my mind. I support you since everything is started since the beginning and maybe i cant remember a time without my support to you.... the time will gone...but i will stay here beside you .. yamada kun hontou ni arigatou gozaimasu.. watashi yamada kun no ko to daisuki 永遠に... dakara ..ganbatte kudasai . Gloria yori. italy. shiharu Oct 02 2017 7:55 am i come every year to leave a message for you. and every year i realized how you have grown in the industry. been following you when you were still really young and i have grown up with you. and everytime i am here, i cant help but feel happy and proud. you deserve everything you have achieved. you are the most hard working person i've known. i admire that side of you. no matter how others view your personality, i will always understand that. you're not perfect but you always do your best. PS i know how much you wanted to do Tantei Gakuen Q again and i hope your wish will be granted. i will be praying with you coz i am rooting to see you with Shida Mirai and Kamiki Ryunosuke again. Miya May 05 2017 9:37 pm I first witnessed his acting through his drama 'The Perfect Son' (which may I say I bought) and I was intrigued with his goofy character. I continued to watch his dramas and movies but there was one that caught my eye, and that was Okaasan, Ore wa Daijoubu - his acting in this movie really touched me and moved me tears (I rarely cry at a movie) and proved to me that with time, his acting improved. Seeing his character portrayals, it's obvious he can undergo various character types; the high school student, an assassin, an upcoming businessman, etc just to name a few. I hear he has two more movies coming out this year, so I can't wait to see him on screen again. Even though he's an idol, and often times idols are stereotyped to not being good at acting, he's one that can beat that stereotype. I can't wait to see how far he'll go in the future. fanfromphil May 02 2017 8:43 pm namiya new trailer is out today. yamada ryosuke looks amazing as usual and i look forward to his acting. i can't help but comment in namiya section too because of my excitement. namiya this september and fma LA this december...thank you for your hard work, yama. fanfromphil Mar 20 2017 1:14 am Why isn't Okaasan, Ore wa Daijoubu listed? Ryosuke played the lead role in that right? I'm not sure if it's a TV movie though. Been a fan of his since Tantei Gakuen Q era, kinda stop (not really stop, just preoccupied with other things, my last perf I saw was Perfume) then renewed my love because of Assassination Classroom. I was staring hard at Nagisa's face coz he looked really familiar and BAM! 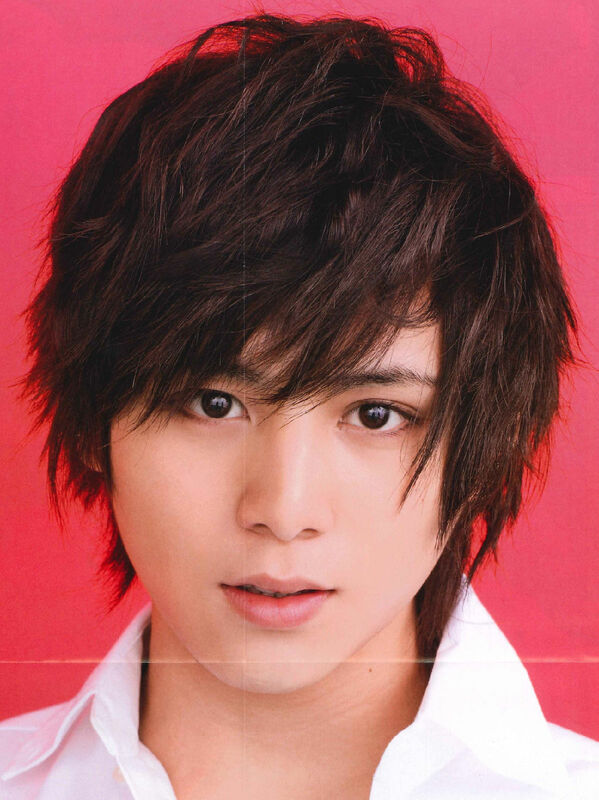 He's Yamada Ryosuke! Gosh! He grew up, I thought. LOL. I love FMA and I love Yamada Ryosuke so I was really glad that they cast him for the role of Edward Elric! He's multi-talented and dedicated so I have faith in him. more fma, the better imho. i've watched almost all of his movies/tv series and i applaud his great acting. truly, he makes me proud as his fan! i also follow hey say jump. glad that all his efforts have been rewarded and i hope that he can grow more and be acknowledge! Mayuyu Feb 20 2017 6:26 am I highly admire Ryosuke Yamada in his acting skills!!! I watched Cain and Abel!! Damn he looks so cute when he cry!! I'm looking forward for your upcoming films in the future!!! Catt Feb 15 2017 6:16 am Can someone explain why in 2016 he got Rookie of the Year award? I swear I have been watching Yamada bouncing around drama to drama since he was a little young boy. Yuko Jan 19 2017 9:19 am Had just watched him in Okaasan, Ore wa Daijoubu. That was some powerful performance by Yamada-kun. It had me sobbing from the beginning to the end. I've also seen some of his other dramas. Beautiful smile! Love you! Sunshine189 Nov 20 2016 7:31 am I was really impressed with your performance in all the films. You are an actor and a great singer. Just so you will have more drama/movie and more awards in the future. I'll always support you. FIGHTING YAMA-CHAN!!! Moon97 Nov 20 2016 7:08 am I realy realy love your act in all. You just amazing actor. Fighting Yama-chan!!! Dina Nov 13 2016 6:17 am Love your act in Cain and Abel :) You caught all my attention in the drama. Never give up, Yu Takada! Never give up , Ryosuke Yamada! portia Oct 22 2016 12:44 pm He's such a good actor! i'm so surprised every time I see him! also please update the award section he won Rookie actor of the year in Japan Movie Critics Award for his portrayal of Semi in Grasshopper. bon bon Sep 19 2016 6:39 pm Wishing for more movies/ drama in the future! seven707 Sep 05 2016 2:18 pm i love his acting in assassination classroom!! Wulan Aug 06 2016 10:14 am love your act in Assassination Classroom! I think Nagisa is really fit in you since youre so kawaii lol. and I just watched Grosshopper, you were totally different and I love it. youre a talented actor I hope you will be in a lot of movies. especially shonen anime movie. cant wait to see you again in Fullmetal Alchemist!. afan Apr 24 2016 7:14 pm waiting for Fulmetal Alchemist.. Yamada-san, ganbatte kudasai! shiharu Apr 20 2016 9:36 am Congratulations on Ansatsu Kyoshitsu and Grasshopper! Yhhey finally you were given movie roles! Been waiting for that for ages. KiRaidesu Jan 28 2016 3:51 am Yamada Ryosuke's act as Hajime Kindaichi was totally awesome and entertaining! Good job! I never like sad movie, but just to see his awesome act, I dare myself to watched "Okaasan, ore wa daijobu". And it made me cry a river. Great job, Yamada-san! Keep up the good work! Waiting for your next project! nana Dec 27 2015 8:08 pm i uses to like him. but he's too short now. i wonder can he get adult roles with that height. hanarin Oct 13 2015 7:18 am Mr. perfect ideaL Lover oF minE...Ummmm...i really want me to be part of your life 4ever. i love every song you sings, every drama and movies you played, every kind of dance you do, and every pictures posted by you and your fans. I wish you'll read this one day!! lulu Jul 20 2015 10:29 pm @dina i knew what are you saying, im from same country ! they will never come here. V Jul 20 2015 10:25 pm im 1000 voter! gaambare !!! Natsuru Apr 16 2015 12:37 pm But Yuuri Chinen is in it too, so they're in one frame together ? Cindy Dagala Jan 27 2015 12:32 am Kyeopta! I love you boy! I Adore you ! Eugene Jan 26 2015 10:47 pm You are so damn cute -____-"
Irlee Sep 08 2014 12:48 am Come to Brunei, please Yamada!! Selena Apr 25 2014 10:31 pm I just started to look into Yamada Ryosuke like two days ago. It's for sure that I don't know him that much. I fell in love at first sight. However, I will still love him with all my heart. If he is different from what I think, then I don't need to know him. Hey Yamada Ryosuke? Have you ever thought about coming to the U.S? Please come! Yuki Apr 12 2014 9:49 am come in romania,please !!! nakamura eva Oct 08 2013 6:57 pm Come To Indonesia, please!!!! i'm very sure that his fans will be sooooooo happy !!!!!! GUST Feb 28 2012 11:45 pm YOU ROCK DUDE! AND KEEP ON SMILING WITH THAT BIG BEAUTIFUL SMILE OF YOUR! greatesttrowll Oct 07 2011 5:55 am YAMARIYA FOR LIFE! I really want him to be with Nishiuchi Mariya again. I love them as a couple. nurifafarrhana Aug 28 2011 10:30 am i know Yamachan is very kawaii....but,dont u think he kind instead of kawaii?? ?i think he is very kind-hearted so i also like him very much....so,i beg u all dont be a person who only take care about yourself...but,i think u all dont like that right?so,i happy to be a big fan of he and if i can be friend with u all....honestly,i also like Yama since i was little very much...although i dont what love is but i think i dont know what my real feeling for him...so,i hope u all can be nice with me not for a rival but a friend....i can? ?do i??? ?i will wait for your answer(minna). Dumbfounded Aug 23 2011 5:12 am Awesome Actor. Just a question, why do people on here leave messages like this is the personal site of the actor and he is gonna reply????? emi-chan Feb 02 2011 11:21 pm yama-Chan.. please come to Indonesia.. i hope you come with hsj members.. arigatou..
Francisca ;D Jan 27 2011 3:03 pm Waaaaaaaaaa ! el es demasiado lindo ! lo amo lo amo lo amo ! <3 ! descargare todos sus doramas ;D hajajaja ! <3 <3 <3 ! Hasna Jan 09 2011 1:03 pm He's HOOOTTT!! mizuki Dec 14 2010 8:29 am iloveyou but says, "cuz really, even if u do confess 2 them, they wont even bother on really saying "yes" 2 u, plus Johnny's E. forbids them to hav girlfriends right?" I won't say anything against you but except for the your last statement.. uhm, I think it's a bit not good to say these words.. especially the part where you said that "they won't even bother on really saying "yes" 2 u".. well, that kinda sounds a bit rude not only to the fans but also the artists.. It feels like you're judging them, saying that kind of thing.. how can you be sure? who knows, they might really notice that fan and likes her.. desyo? though I agree a little bit about the being selfish thing of the fans.. let's just support them as pure fans..
lovinghimsomuch Oct 29 2010 7:51 am were only fans ryt, i know that.. giving up now will be the best opio. were just dreaming of a very beautiful dream that were just hurting ourselves, in the fact that we wouldn't be his mine.. we wont be!thats the reality..
all we can do for now is to wish him the best and be happy in who he is and who will he be in the future^^ waking up now will prevent us from the pain.. let's be pure fans now! and to you naruto23fan i hate you for saying those hurtfull thing to us, and yes we know!WE WONT BE!! but please let us realise it in the way we wont hear those stupid things from you! yes we are just fans, but feelings can be hurt you know! and we can change it when the ryt time comes! and not just you told us to do so!! iloveyoubut Aug 25 2010 11:21 pm i love yamada too.. but seriously.. im a HUGEE fan.. but its kinda creepy-- for u guys 2 say things like u want him 2 b urs..
dontb selfish~ ahaha xD no, but really. i daydream about stuff like dating them too like u guys but i dont really announce it here [i jst did but] cuz if he really does see this and hav some1 translate it, DUDES he will get PREAKED OUT. that is just-- uhh.... think about it. if u wer him, wouldnt u get creeped out? WAKE UP and just CHEER HIM AND THE REST OF THE HSJ as their FANS. A PRECIOUS FAN. cuz really, even if u do confess 2 them, they wont even bother on really saying "yes" 2 u, plus Johnny's E. forbids them to hav girlfriends right? HOPE SO. :)) I AM ONE. roXanNE Jun 08 2010 3:14 am ..omedetoo..i know you have no time for things like these but hoping though that someday you'd be able to read these things..so many guys love you,and so, you must stay as humble as possible,be as who you are..be the best of what you do..be positive as often...you can do it - - opps! you've done it already..
camille(miyuki) May 31 2010 8:05 pm otanjoubi omedetou!!!!!!!!!!!!ryo-chan!!!! !for me ryosuke yamada is.....hmmmm......a perfect man,he is the best!!!!!!!!! !i am a big,big fan of ryosuke,i wish that we meet someday!!! maiimond May 09 2010 2:22 am otanjoubi omedetou!!!!!!!! otanjoubi omedetou!!!!!!!! otanjoubi omedetou!!!!!!!! otanjoubi omedetou!!!!!!!! otanjoubi omedetou!!!!!!!! i wish you all!!! I HOPE in this great moment, u'll be a more great, cute, kind, funny boy!!!!!!! ganbatte YAMA-CHAN !!!!!!!!!!!!!!!!!! i've got the same feeling that you have there.. every night, i look up the sky, wondering if he's ok..
and when they're talking about yamashii, no word can describe the pain i'm bearing with..
he doesn't even know that i exist, but, just like you, i won't also give up.. he is the first of my dreams, and i can't finish my dreams without him..
i really hope someday, i would meet him.. that someday, he would smile to me.. SOME THINK THIS IS WEIRD AND 'CORNY', BUT IF THEY LOOK INTO THEIR HEARTS, THEY WOULD REALIZE THEY'RE JUST LIKE US. Kiyoshi Apr 23 2010 1:57 pm Big fan of Ryosuke. He is very handsome. ma.tovic Apr 12 2010 6:58 am .........ai shite iru yamada ryosuke ...i am your huge fan... he is cool and nice we are compatible... because we have the same favorites..
lovinghimsomuch Feb 13 2010 6:54 am call me anything you whant..but ive been chasing after ryosuke yamada my whole life..am still 14 years old..but i can feel the passion of love within me towards him..
but i wont give up for him..cause the only faith that iam holding is my deep love for him... ill chase him my whole life..
all a wanted to do is to watch him at the corner and watch him smilling..
even though in his world..
lovinghimsomuch Feb 13 2010 6:50 am call me anything you whant..but ive been chasing after ryosuke yamada my whole life..am still 14 years old..but i can feel the passion of love within me towards him..
Riez Jan 02 2010 11:13 am Wow! By the way, Ryo-chan! Hope you're okey! Daisuke Ryo-chan! camille Dec 22 2009 4:51 pm he's sooo handsome! way too cool!I'm totally obsessed! He captured my heart! AISHITERU YAMADA-KUN!!! i will go to japan to see you and also other hsj members.,.,. renelyn Sep 07 2009 5:40 am aishiteru ryosuke.,.,. hope i will see you in person,.,. Ku Aug 19 2009 11:59 pm A RARE TALENT HE IS!!!!!!!! J-JIMUSHO IS SOOO LUCKY TO HAVE HIM!! mimic27 Aug 14 2009 12:22 pm RYOSUKE YAMADA ur the BEST LOVE YOU SOOOOOOOOOOOOOOOOOOOOOOOOOO MUCH!!!! O_O HOPE TO MEET YOU ONE DAY !!!!!! Ten Ten Aug 13 2009 8:34 pm Yamada Ryosuke tottemo kakkoi! Kanna Aug 03 2009 1:06 pm Yamada-kun has alot of potential in the entertainment world. Hopefully he will go solo when he is older but for now he is best to be with Hey! Say! JUMP. ana maria Jul 29 2009 3:14 pm amo a ryosuke yo lo conoci!!!!! anyone Jul 23 2009 10:01 pm To comment #16 Since when one of his closest friends is Shida Mirai ? -_- I love Yamada and Shida but just curious :) GO YAMADA ! GAMBATTE ! sweet laida bautista Jul 13 2009 7:09 pm konnichiwa! genki des ka? ErIkA Jun 24 2009 1:33 am yamada ryosuke is soo kakkoii!!! I wish to meet him some day. Unfortunately, im all the way in America(USA)...but mayb some day! AH!!! Love you Yamada!!! Hope to C U one day! Yuki May 04 2009 10:50 pm ..hmmm....i think he's really talented... ..i thought he's closest friend is yuri chinen,so it's yuto..??? ...well, he likes "cool girls"..i wonder if he's really........never mind..
dylaw Apr 27 2009 10:35 pm So who is yamada's younger sister? kiss kiss huggle to yama kun* MUHWA!!! rv Mar 22 2009 8:17 am yes, the older sister is chihiro. but the younger sister is mika. ying Mar 13 2009 4:49 am dun u think his discribing of his girl types quite similar to shida mirai??? guadalupe Jan 21 2009 11:30 pm does he really like chubby girls?